+ Can enjoy/party like hell! 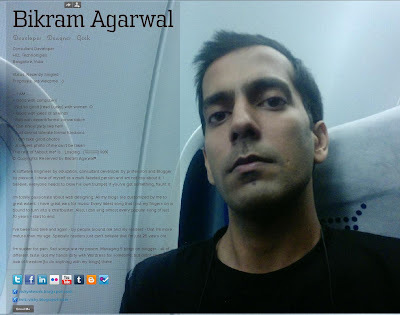 A software Engineer by education and consultant developer by profession; Blogger by passion. I think of myself as a multi-faceted person and am not coy about it. I believe, everyone needs to blow his own trumpet. If you've got something, flaunt it. First of all, I'm totally madly passionate about web design. All my blogs are fully customized by me to great extent. Have great ears for music. Every latest song that I put my fingers on is bound to turn into a chartbuster. Also, can sing almost every popular song of last 10 years - start to end. I've been told time and again - by people around me and my readers - that I'm more mature than my age. Specially readers just can't believe that I'm just 25 years old. I'm sucker for pain. Sad songs are my poison. Managing 5 blogs on blogger - all of different taste. Got my hands dirty with Wordpress for sometime; but didn't like the lack of freedom [to do anything with my blogs] there.